1. One in four Americans over the age of 65 years old fall each year. 2. An older adult is treated for a fall in the emergency room every 11 seconds across the country. 3. Unfortunately, every 19 minutes, an older adult dies as a result from a fall. 4. 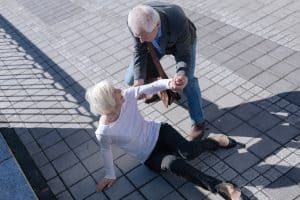 In older adults, falls are the leading cause of fatal injury and the most common cause of trauma-related, nonfatal hospital admissions. 5. In 2014 alone, the total cost of fall injuries was $31 billion! 6. By 2020, it is projected that the financial cost for older adult falls is expected to increase as the population ages, which could very well reach $67.7 billion. These are some SCARY statistics for our aging population. As our “baby boomers” age, it is important to raise awareness about the options offered in the community to help prevent the aging population from becoming one of these statistics. With summer officially in swing, older adults may find themselves outside gardening, playing with grandkids, taking a walk, or just simply enjoying the warmer weather after being cooped up from a cold winter. With all these factors, they may find themselves on uneven ground, losing their balance doing activities their bodies aren’t accustomed to after a winter of a “lazier” lifestyle inside, or even dehydration with not consuming enough fluids during the warmer days. At ApexNetwork Physical Therapy, we offer numerous services to the community to help keep you safe and fall-free for the summer months. 1. Free Injury Screenings- after a long, cold winter, you may try to increase your activity levels with the weather warming up. If you’re having aches and pains that you aren’t used to, ApexNetwork Physical Therapy offers free injury screenings for these aches and pains. If therapy is warranted, the evaluating therapist will work with you to get a prescription from your primary care physician for continued therapy visits to improve his aches and pains, making you safer and feeling more equipped to address these pains with an exercise program for home. 2. Free Balance Screenings- if you’re feeling a little uneasy on your feet, much like the free injury screen, our therapists are willing and able to perform balance screenings with the most up-to-date “gold standard” balance tests, proven by research. If significant balance deficits are found, the evaluating therapist can educate you on proper body awareness, assess if any type of assistive device (walker, cane, etc.) is needed, or can send a prescription to your primary care physician for further physical therapy visits to address the balance deficits and decrease your overall fall risk. 3. Free Vertigo Screenings- if you’re noticing the “room is spinning” or you’re feeling a little dizzy with changing positions, this can increase your risk of falling as well. Many of our Apex clinics have clinicians trained in Vestibular Therapy (treating the “vestibular” system, which is your balance system in your body). With this training, the therapist can help determine the cause of your dizziness with certain testing or help determine if there is more of an underlying factor for your dizziness. If Vestibular Therapy would be beneficial, your evaluating therapist can get an order from your doctor to continue with treatment for physical therapy, which would improve your balance and stability while decreasing your risk for falling. With these screens, all you have to do is call or drop in to your local ApexNetwork Physical therapy and the staff at that clinic will assist you with all of your needs. Our goal is to keep you safe and active through the summer months, which means keeping you off the ground and on your feet all summer long.